Machiavellianism is also a term that some social, forensic and personality psychologists use to describe a person's tendency to be unemotional, and therefore able to detach him or herself from conventional morality and hence to deceive and manipulate others. In the 1960s, Richard Christie and Florence L. Geis developed a test for measuring a person's level of Machiavellianism (sometimes referred to as the Machiavelli test). Their Mach - IV test, a twenty-statement personality survey, became the standard self-assessment tool of Machiavellianism. People scoring high on the scale (high Machs) tend to endorse statements such as, "Never tell anyone the real reason you did something unless it is useful to do so," (No. 1) but not ones like, "Most people are basically good and kind" (No. 4), "There is no excuse for lying to someone else," (No. 7) or "Most people who get ahead in the world lead clean, moral lives" (No. 11). Using their scale, Christie and Geis conducted multiple experimental tests that showed that the interpersonal strategies and behavior of "High Machs" and "Low Machs" differ. Their basic results have been widely replicated. Measured on the Mach - IV scale, males are, on average, slightly more Machiavellian than females. Machiavellianism in the workplace is the employment of cunning and duplicity in a business setting. It is an increasingly studied phenomenon. The root of the concept of Machiavellianism is the book The Prince by Machiavelli which lays out advice to rulers how to govern their subjects. Machiavellianism has been studied extensively over the past 40 years as a personality characteristic that shares features with manipulative leadership, and morally bankrupt tactics. It has in recent times been adapted and applied to the context of the workplace and organizations by many writers and academics. The Machiavellian typically only manipulates on occasions where it is necessary to achieve the required objectives. 1 2 3 4 5 6 7 Jones, Daniel N.; Paulhus, Delroy L. (2009). "Chapter 7. 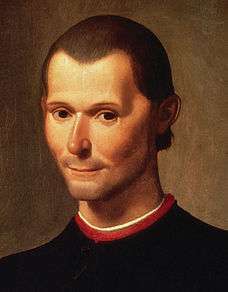 Machiavellianism". In Leary, Mark R.; Hoyle, Rick H. Handbook of Individual Differences in Social Behavior. New York/London: The Guilford Press. pp. 257–273. ISBN 978-1-59385-647-2. 1 2 Christie, R. & Geis, F. (1970) "Studies in Machiavellianism". NY: Academic Press. ↑ Goleman, Daniel (2006). Social Intelligence.